[Free Pattern] These Skulls Motifs Are Fun, Easy And Addictive! This project is rated Intermediate. If you like compliments, this long sleeved, hooded long jacket will bring you lots for sure. The Bouvardia Hooded Jacket courtesy of Spotlight is absolutely awesome! The hood is large (what I was looking for) and made in the recommended material, the quality is great! With the rights colors and with this stitching, this pattern can be used to make beautiful jacket perfect for any occasion or simply casual. Thanks to Spotlight for the article inspiration and featured image. I am going to learn to crochet so I can make this. It is beautiful. Am I the only one getting an error message when I try to follow the link to the pattern? I can’t get the link to work and I really want to make this! Jennifer, please click on the words Bouvardia Hooded Jacket and wait a moment for the page to upload. If you get error, refresh the page. The pattern’s site may be too busy and may give error. The pattern is there and the links are correct. Hope it helps. Dang it! I really would love to make this! Me too! So sad, I really liked the look of this one. Aw I would live this pattern! Cheryl Leggett, Julie Horn Sherf, Whitney Morrison, Lauren Blake-Plemons , please click on the words Bouvardia Hooded Jacket and wait a moment for the page to upload. If you get error, refresh the page. The pattern’s site may be too busy and may give error. The pattern is there and the links are correct. Hope it helps. It still comes up with an error. It’s probably chrome – I’m having all kinds of trouble with it today. Hey, PJ, I’ve learnt about this pattern that some people can see it , some people can’t, I couldn’t say why. It works perfect on my desktop/laptop in all browsers and the link is correct. It does take a longer time for the pattern to upload AFTER the page is up. Maybe you can try a different device? Hope you find a way to download it! Whitney Morrison , please click on the post above and check the comments area. I added the full link in the comments area, look for your name and click on the link in your comment. Let me know please if you can get it like this. No it still isn’t working. I even found it on Pinterest and it doesn’t work either. Might just be their site. Bummer. Whitney Morrison, keep trying. The site is there and is up, could be just bad timing or something. Eventually in a few hours try again. I got a 404 too and 30 minutes later, it worked. Eventually try on a different device/laptop. Could be a 404 error when on a mobile and working just fine on a computer. Katie Howell Wiggins what do you think? Error found page – is all I get! Got it, go into pinterest and search crochet hooded vest and it’s there. For those of us that have had issues with trying to get this pattern, I finally found it! 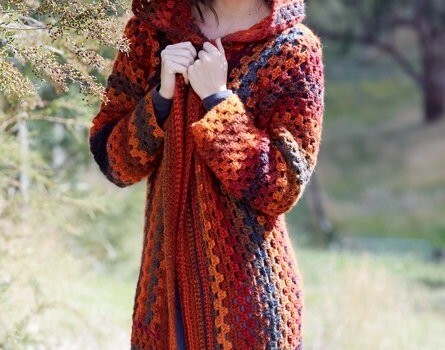 I went to pinterest and typed in crochet hooded vest and there it is! Anyone has a link to share? 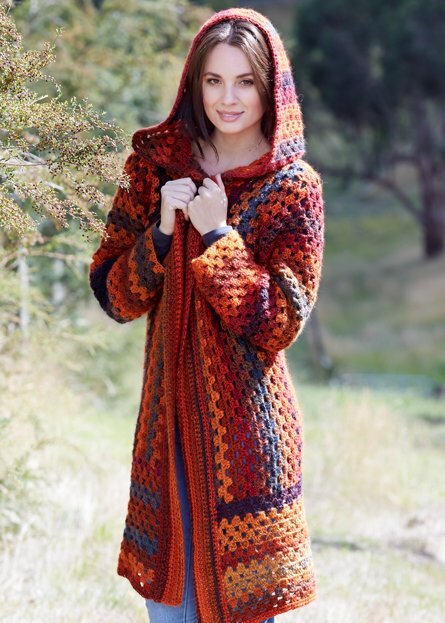 Lynette, the link is fine and correct ( linked to the name of the pattern: Bouvardia Hooded Jacket). The page on the site is uploading a bit slow, but the pattern is there. I’m not sure why you get an error page. Maybe try a different browser? I’m just going to unfollow DaileyCrochet, like everyone else I know has. Trying to get to the patterns is ridiculous ..every time. IT looked so nice at first, then I clicked on the link to Ravelry. Um no…changed my mind. Here is the jacket that is in the pic. Getting it was easier looking up the name: Bouvardia jacket. Ravelry had it with a link to spotify in Australia where you could click a PDF download. My daughter is making this one. She’s twelve. It goes pretty quick and easy! I cant get the pattern the page says 404 page not found. Sadly, the pattern is no longer available.